We are making comprehensive information available to users of thermal analysis, through our application handbooks and our biannual UserCom journals. The UserCom journal contains articles that focus on specialized applications, information regarding new products, as well as tips & tricks for using our devices. Are you interested in reading the UserCom journal? If so, please contact your nearest METTLER TOLEDO representative or use the link to our UserComs. The informative and comprehensive handbooks explain the different measurement technologies involved in thermal analysis and provide a broad range of user-oriented applications. 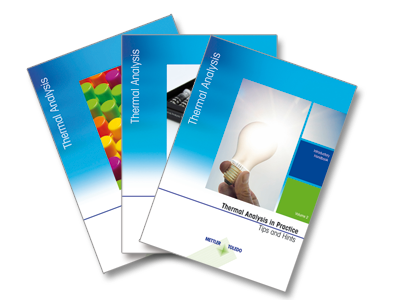 METTLER TOLEDO's handbooks provide a thorough overview, both theoretical and practical, of the main thermal analysis techniques and their applications in different industries. UserCom is a technical journal published twice a year. 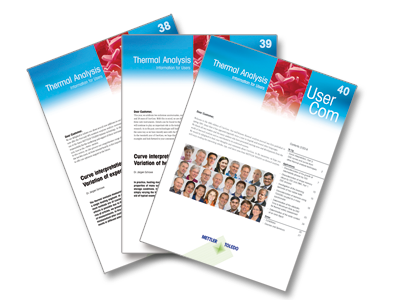 Written by thermal analysis experts worldwide, UserCom articles are intended to help scientists solve complex analytical problems. 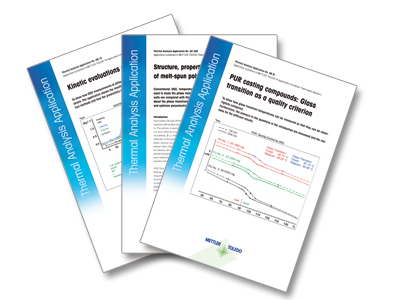 Thermal analysis applications, including useful tips for performing sorption experiments by TGA/DSC. Thermal analysis applications, including useful tips for how thermal analysis can be used to analyze polymers (Part 6: TMA and DMA of elastomers). Thermal analysis applications, including useful tips for how thermal analysis can be used to analyze polymers (Part 5: DSC and TGA of elastomers). Thermal analysis applications, including useful tips for how thermal analysis can be used to analyze polymers (Part 3: DSC of thermosets). Thermal analysis applications, including useful tips for how thermal analysis can be used to analyze polymers (Part 1: DSC of thermoplastics). Thermal analysis applications, including useful tips on the correct use of analytical measurement terminology (Part 2: Measurement uncertainty).